On September 8, 2017, the Robert G. Sanderson Community Center of the Deaf and Hard of Hearing celebrated its 25th anniversary. Approximately 450 Utahns joined the event celebrating with games, dinner, and performance. 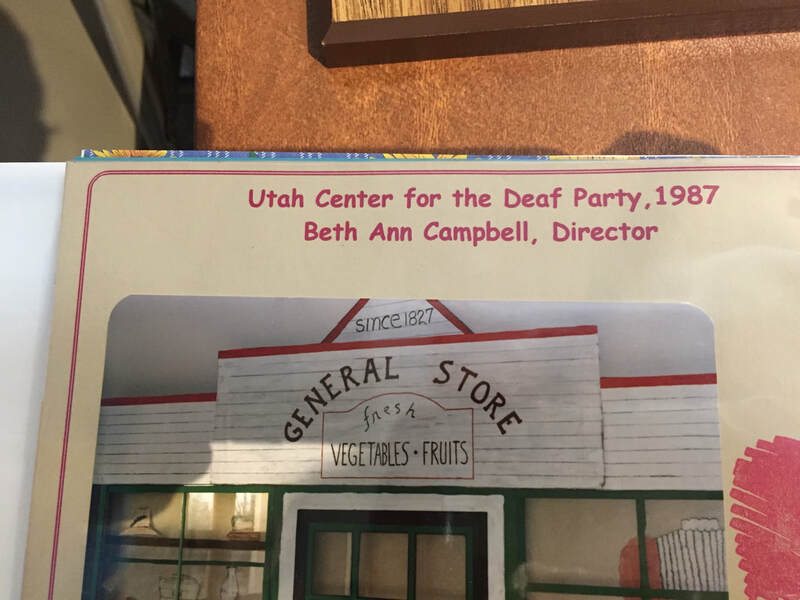 The theme of the event was called “Blast from the Past” where the community center reviewed its rich history dating back to 1946 when a need for a meeting place was recognized for those who were Deaf and hard of hearing in Utah. 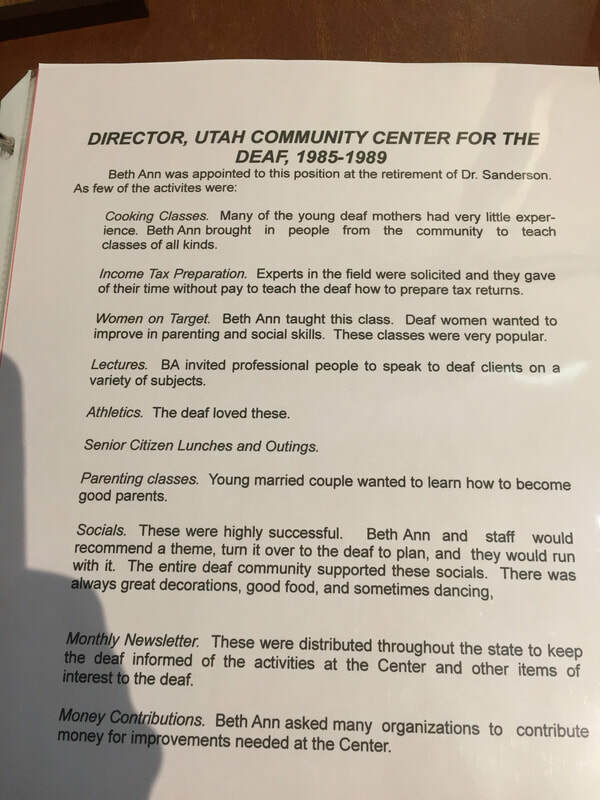 Since then, early leaders worked hard in the 1960s to establish a meeting place including Dr. Robert G. Sanderson who was the first deaf coordinator in Utah. In 1983, the first community center was inaugurated in Bountiful, and the current Sanderson Community Center in Taylorsville was opened in 1992. 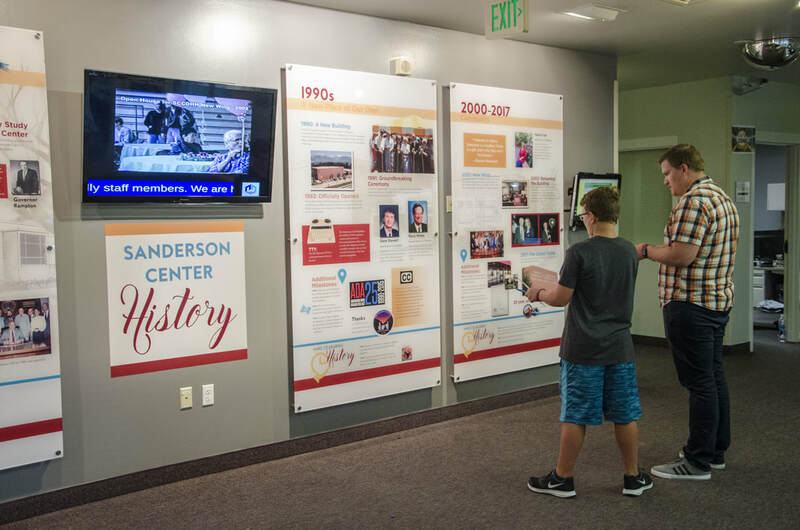 Historical timeline panels of the Sanderson Community Center were exhibited in the lobby area where people could discover the history of how the community center came to be. 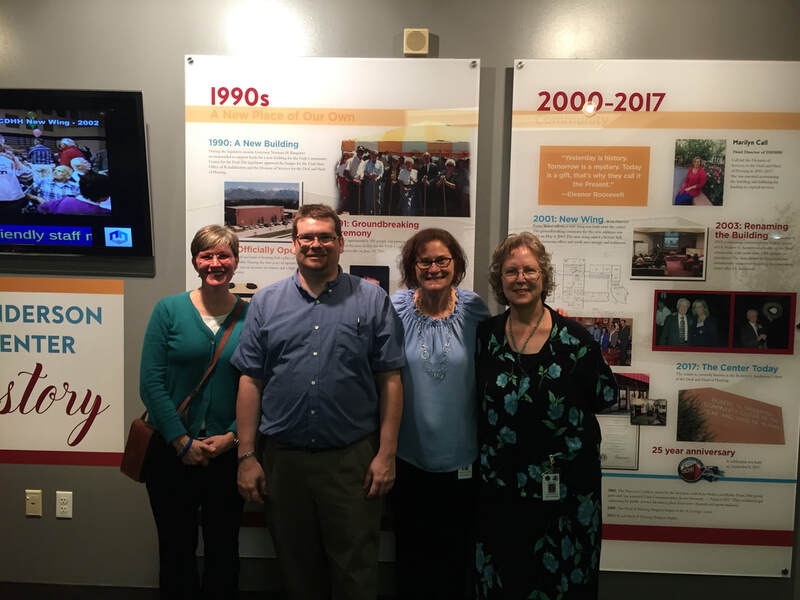 Joene Nicolaisen, Diego Acosta, Robin Traveller and Jodi Becker Kinner worked together to make historical panels a reality. Marilyn T. Call, Director of the Division of Services for the Deaf and Hard of Hearing, for her many years of service. She retired in December 2017. Mitch Jensen, Certification Program Director of the Utah Interpreter Program, as the longest working employee at the center. Jodi B. Kinner and Valerie G. Kinney community members for their dedicated work in compiling the “Utah Deaf History” website. 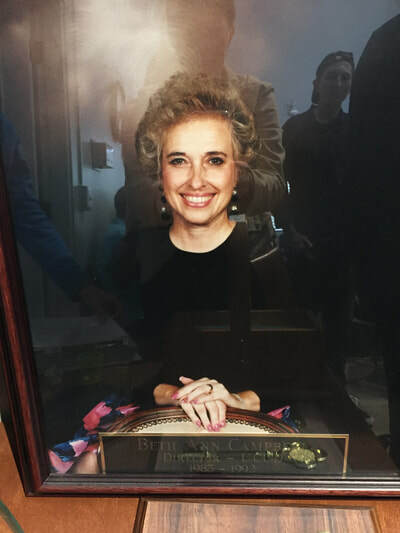 The conference room inside the Sanderson Community Center has been named Marilyn T. Call Conference Room in honor of her longtime service as director. She has had years of experience on the Capitol Hill and good relationships with many legislators. When she was hired, she realized there was much work to be done to expand needed social services so the division could match the great caliber of the building (Sanderson, 2004). In her role as director of the Sanderson Community Center, Marilyn continued to expand or add divisions and services. She assisted individuals who were Deaf or hard of hearing in applying for employment opportunities. She supported the creation of various programs that included outreach and technology, interpreter mentoring and training, and the development of free classes related to hearing loss. Marilyn supported the development and expansion of a demonstration lab loaner bank, which allows Deaf and hard of hearing individuals to try out various assistive technologies before they purchase the device that suits them. She also fought for funding to hire mental health counselors and case managers fluent in American Sign Language (Hamilton Relay, June 3, 2011). 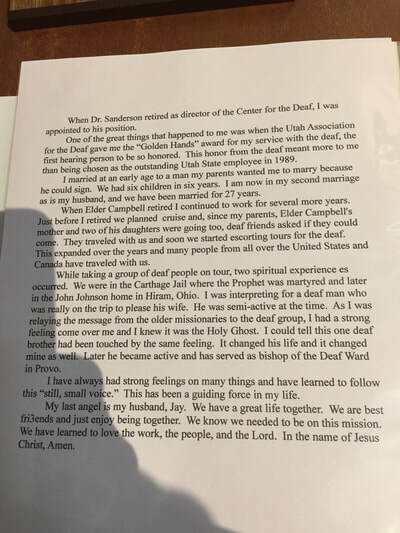 Moreover, Marilyn helped to obtain funding for positions and office space to establish the satellite office known as Southern Utah Deaf and Hard of Hearing Program in St. George, Utah. One year after the Sanderson Community Center was moved under the Department of Workforce Service in 2016, Marilyn retired in December 2017. Her years of leadership, devotion, and commitment are greatly appreciated among the Utah Deaf community. 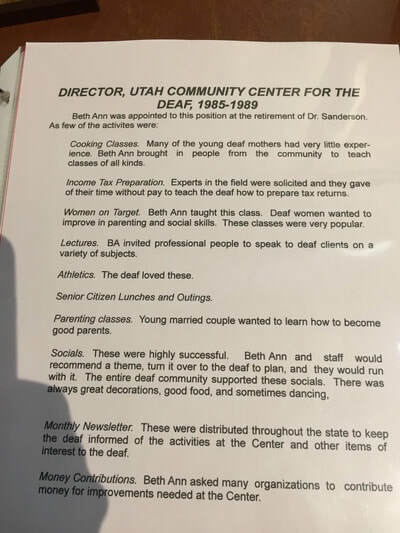 Marilyn T. Call's ​biography can be found in the "Biographies of Prominent Utah Deaf Women" webpage. 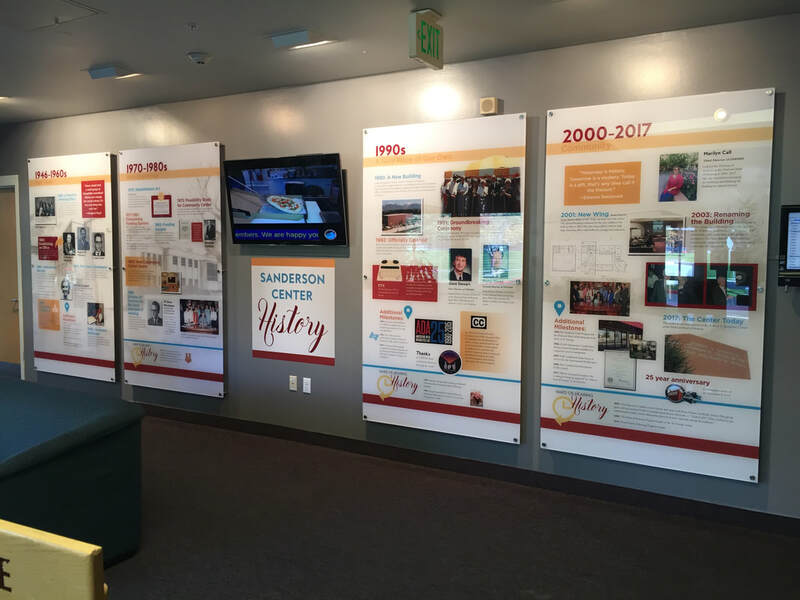 For a closer look, you can view the historical timeline panels of the Sanderson Community Center. Enjoy! Another error on the panel is the title of Beth Ann Campbell's job as a "Program Specialist" when in fact she was indeed a Director of the Utah Community Center for the Deaf from 1985 to 1992. After Dr. Robert G. Sanderson retired in 1985, Campbell was appointed to his position. See the letter written to the former director clarifying Campbell's job title. Also, see the evidence photos of Campbell's title. The photos were taken two months after the 25th Anniversary Celebration. It was too late to correct Campbell’s title on the panel. 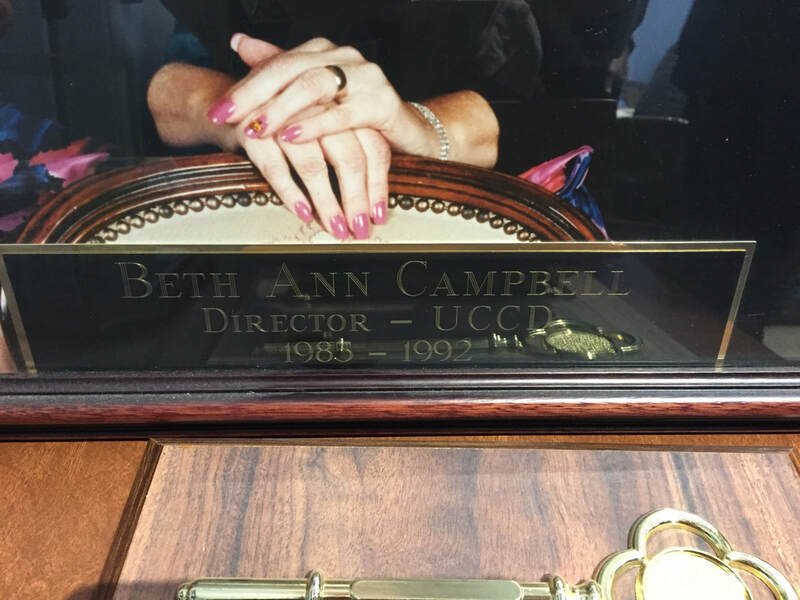 Although the expense coverage to fix the mistakes is a concern, I hope those two will be corrected and Campbell's picture be restored to the wall where it belongs (It was taken down twice in the Marilyn T. Call Conference Room due to a misunderstanding of job title). If it was not for Campbell's dedication and contribution to the community, the Deaf community may never appreciate the services at the Sanderson Community Center nowadays. Marilyn Call selected for Hamilton Relay 2011 Better Hearing and Speech Month Recognition Award for the State of Utah. June 3, 2011. Sanderson, Robert G. A Brief History of the Origins of the Robert G. Sanderson Community Center of the Deaf and Hard of Hearing. March 9, 2004. Sanderson Center 25th Anniversary Celebration. Community Connections with Utah’s Deaf and Hard of Hearing Newsletter, October 2017, p. 3 & 4.